Proximity Transducer System Operation | What is a Proximitor ? 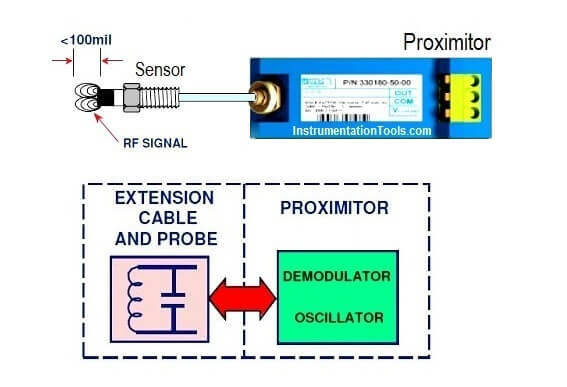 Proximity Transducer System provides an output voltage directly proportional to the distance between the probe tip and the observed conductive surface. It is capable of both static (position) and dynamic (vibration) measurements, and is primarily used for vibration and position measurement applications on fluid-film bearing machines, as well as Keyphasor and speed measurement applications. 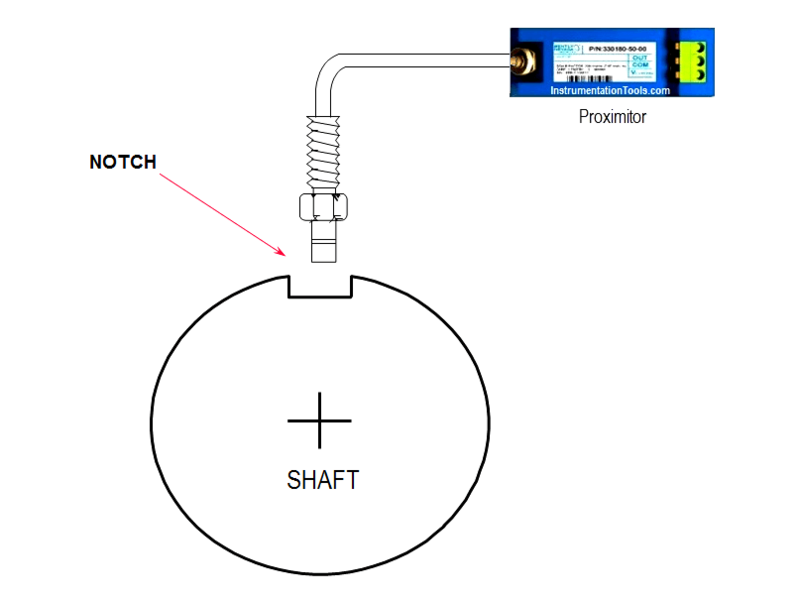 Proximity Transducer Systems provide an electrical signal that represents the distance between a conductive surface and the probe tip of the system. Generate a radio frequency (RF) signal using an oscillator circuit. Condition the RF signal to extract usable data using a demodulator circuit. When conductive material is present in the RF field, Eddy Currents flow in the surface of that material. The penetration depth of the eddy currents depends on the material’s conductivity and permeability. 4140 steel penetration is around 0.003 inches (3 mils). 1. Amplitude is at a MINIMUM when distance (Gap) between probe and target material (Target) is at a MINIMUM. 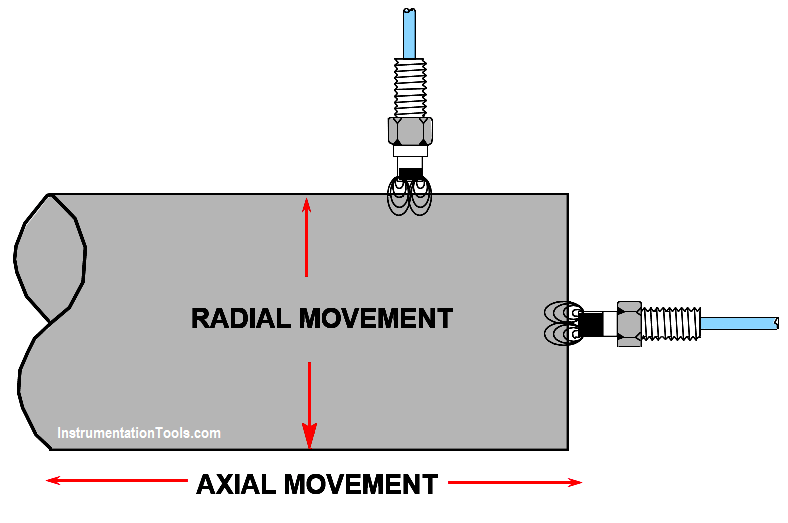 Maximum eddy current flow occurs. 2. Amplitude is at a MAXIMUM when distance (Gap) between probe and target material is at a MAXIMUM. Minimum eddy current flow occurs. If the target is moving SLOWLY within the RF field, the signal amplitude INCREASES or DECREASES SLOWLY. 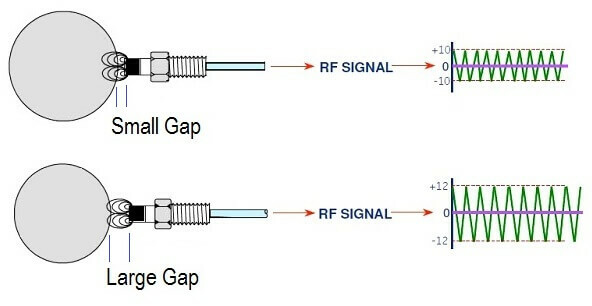 If the target is moving RAPIDLY within the RF field, the signal amplitude INCREASES or DECREASES RAPIDLY. Oscillatory movement of the target causes the RF signal to modulate. The demodulator circuit deals with slowly or rapidly changing signal amplitude in the same way. If the target is not oscillating, as might be the case with a thrust probe, the Proximitor output is a constant DC voltage, called the gap. 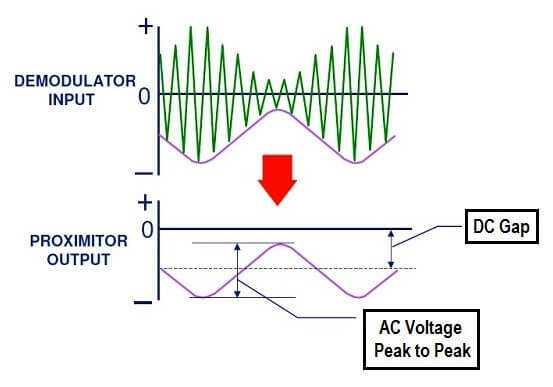 If the target is oscillating (gap changing slowly or rapidly) the Proximitors output is a varying DC voltage (AC) shown above by a sine wave. If the probe is observing a vibration, the Proximitor will provide both a DC (gap) and an AC (vibration) component in the output signal. A typical system frequency response is from 0 Hz (DC) to 10 kHz. Newer transducer systems, such as the 3300XL proximity system have responses up to 12 kHz. Probe response is verified by measuring and creating a calibration curve.